"Father Louie" to the early gay community in Halifax. He was one of the brave pioneers in Halifax who were openly gay and proud in the early days. Father Louie spent his formative years in his home town of Grand-Digue, NB, before moving to Halifax, where he graduated from St. Patrick's High School in 1955, completed undergraduate studies at Saint Mary's University, and theology at Holy Heart Seminary. 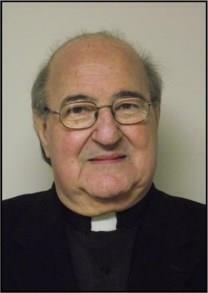 He was ordained to the priesthood in 1962. Formally minister at the Victoria General and the New Halifax Infirmary Hospitals as well as a Supervisor in Clinical Pastoral Education there as well as at the AIDS Coalition of Nova Scotia during much of the AIDS Crisis of the '80s and '90s, and Director of Pastoral Care (now named, Spiritual Care) at Halifax's Queen Elizabeth II Hospital for 13 years. Informally he was minister and friend to anyone, but particularly in the LGBT community. He was supportive of the alcoholic and addicted subgroup of our community and arranged for space for the local 12-step LGBT Alcoholics Anonymous group, LiveAndLetLive, to have their annual conference, the CourageRoundup. A family trait, Louis loved to play cards, and many Haligonians know him as a formidable bridge partner or opponent. At family gatherings, retreats, and vacations, he played Hearts, Crib, 200s and 45s, all with a keen mind and fun sense of competitiveness. Louis' tastes in food were as eclectic in food as they were in music and people. He loved haute cuisine before the opera in New York, or hot dogs off the BBQ while listening to Acadian jigs -- and almost anything in between. Louis was also a proud Acadian who displayed his Acadian flag at every home he lived in. In 1996 Louis took a personal odyssey to Louisiana to expand his understanding of the impact the expulsion of the Acadians had on that area, and of course took time to enjoy the incredible food. Ross Haynes, QC, writes: I met Louis in the early 90's in the midst of the AIDS/HIV crisis. I was first Chair of AIDS Nova Scotia, and later with WilsonHodder was co-chair of the AIDS Coalition here in Halifax, where at the time Louis was ministering. Rev Louis was an inspiration to many in the community concerned with HIV/AIDS and he took leadership in understanding and confronting the challenges facing the LGBTQ community and the wider population. Louis was a leader and I was better for having met him. My condolences to Louis' family and friends - we have lost a fine man.